The Nokia E63 Blue is enveloped in a 113 x 59 x 13 mm casing and weighs 126 grams, which is in fact excellent for all the features this gadget provides. The 2.3 inches QVGA screen has the resolution of 320 x 240 pixels and displays up to 16 million colours. The QWERTY keypad , navigation key and dedicated one-touch key makes it very user friendly. The 3G HSDPA, WLAN Wi-Fi and GPRS give the user smooth Internet surfing experience. 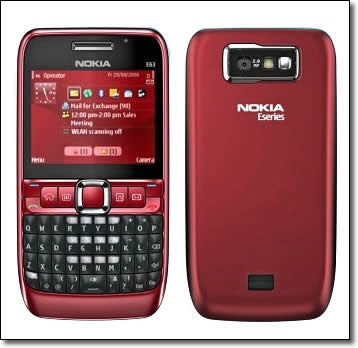 The Nokia E63 Blue has 110 megabytes internal memory. Storage space is expandable up to 8 GB. It's battery supports 11 hours of GSM talk time and 432 hours of GSM standby time. While in WCDMA mode, the battery lasts 4.5 hours of talk time and 480 hours of standby time. The 2 megapixel camera comes with digital zoom, LED Flash, capture and colour tone mode. Good connectivity is ensured through Quad band and WCDMA. Embedded and Java games, the handset provides the high quality gaming experience.